Monica Gale Top STAMPIN'UP! 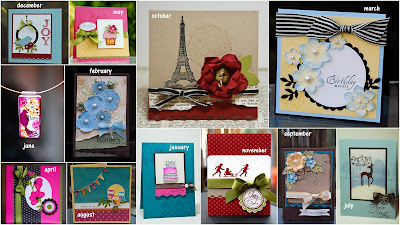 UK Demonstrator: A YEAR OF STAMPIN'UP CARDS ..
A YEAR OF STAMPIN'UP CARDS ..
Is so hard to believe that there are only a few hours left in this Old Year and one has to ask the same old question WHERE DOES THE TIME GO? to be fair I am not interested where is it going, I am more interested to know why is it going so fast? hard to believe indeed. Most people started to show their favourite cards on their blogs and last night decided to put together a collage of my favourite projects this year. It was fun for me to look past all those months and I was shocked do discover that I do not blog that much, some months I had a hard job picking a winner. Hmm can you see a resolution being made here? I will not make one though but will try and post more. I want to thank each and every one of you for visiting my blog for your lovely and encouraging comments and to wish you a fabulous and very HAPPY NEW YEAR !!!!!!!!!!! Here's my collage for you all. ENJOY !! click collage for an enlarged view. See you next year !!!!!!!!! Happy New Year to you too, Monica. my favourites in your collage are definitely March and April. I have cased both of these repeatedly so many thanks for sharing them. Great collage - I had forgotten a few of those, but they are all good ones. Happy New Year to you Monica!! All your cards are gorgeous but my favourites are the Christmas ones!! Seems your Sale-a-bration catalogue is the same as ours. The Punch Bunch set is my favourite! Hi Monica - I just popped by to say hello and thank you for becoming a follower of my blog. I so love to read people's comments! Your collage is fabulous - think my favourite is October with that awesome flower.